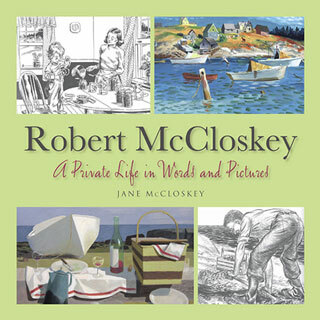 Ask almost any family that summers on the coast of Maine , who is the author that brings the coast of Maine into their lives, and they will say without hesitation "Robert McCloskey." Bob McCloskey was the author of eight children's books, the most famous of which (aside from Make Way for Ducklings which takes place in Boston's Public Garden) were Blueberries for Sal, One Morning in Maine and Time of Wonder, all set on the family's island on Penobscot Bay when his daughters were small. Not much happens in the books, Bob and the girls dig clams for chowder; Mom and Sal go blueberry picking and run into a mother bear and her cub doing exactly the same thing; a scary storm brushes by the island but everyone's OK. But look closely at these books and you will also see that there is a lot food related activity going on. Not just clamming, berry picking and traveling by boat to the general store for supplies, but cooking, picnicking, canning and just being in the kitchen. In fact, just about the only indoors that exists in these books is the kitchen. 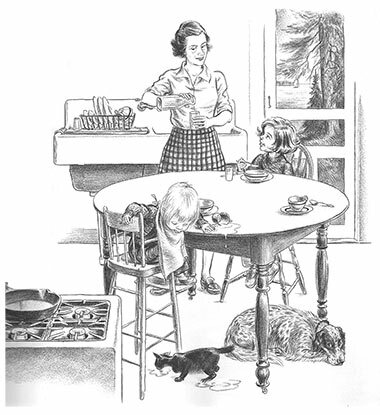 This may be because Peg, Bob's wife, was an excellent and adventurous cook, even on a remote island, but Bob also knew that the kitchen is the secure center of family life and particularly young family life--note the charming detail of toddler Jane spilling her milk for the cat, while the family dog looks on morosely.